4. Your Forex product is ready! Be it currency exchange or money transfer from India, let us know your forex requirements. Just select the currency, enter the amount, and click on Get Rates. Quotes from the nearest RBI Authorized money changers/banks will show up on your screen, instantly! Compare from the quotes shown. 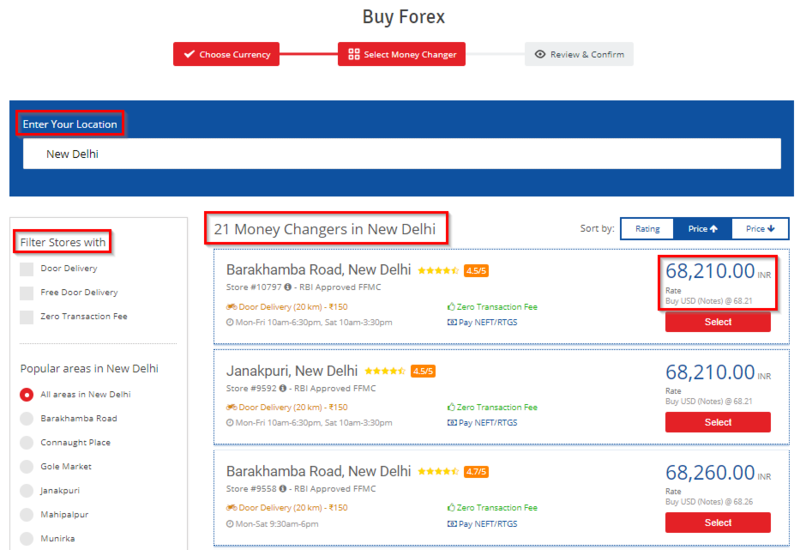 Select the money changer of your choice. Place the order after entering your contact details and reviewing the forex order. Review details like Payment Mode, Door Delivery, Forex Outlet and Order Summary. Kindly wait for our confirmation call. 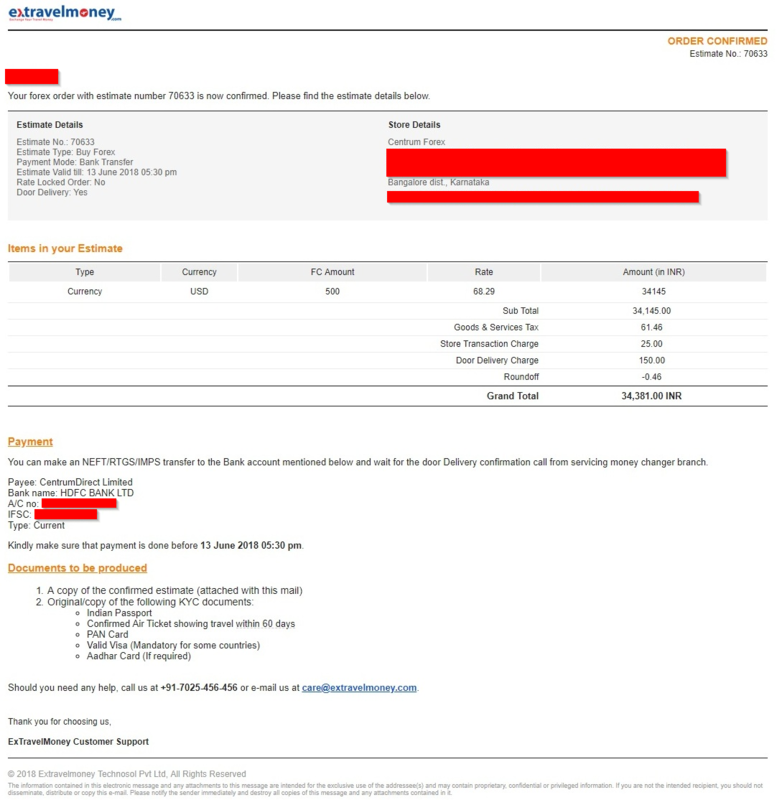 Once the order is confirmed*, we will send you the money changer details like address and bank account number to your registered email ID. You can also opt for self-pickup or door delivery of forex or related documents. Now that you have confirmed the order, your next step is to make the payment directly to the chosen service outlet through the bank account number provided in the confirmation mail. Payment to be made directly to the chosen money exchange house by DD/NEFT/RTGS/IMPS/Payment Gateway. You can also make cash payment at the chosen store if the total amount to be paid falls below INR 49,999. Pay directly to the chosen forex store by NEFT/RTGS. No cash payments possible. No payments required to the chosen forex store. Upon selling your foreign currency, money will be credited to your bank account directly by the forex store. You can also receive the money as Cheque or in cash (only if less than INR 49,999) by visiting the store. 4) Your Forex product is ready! Foreign currency notes** or forex card as per your order is ready to be picked up from the chosen store. Share the KYC documents and complete the transaction, the same day. Carry the reference number/UTR numbers for tracking payments. For door delivery***, the booked forex products will be released after realization of funds. You can walk into the chosen store with the foreign currency/card or can request door pickup***. Indian Rupee Cash Payments are limited to INR 49,999 and beyond this amount, payment could be made by account payee cheque or directly to your bank account by NEFT/RTGS. You can submit the KYC documents directly at the chosen store or can request door pickup. The wire transfer copy will be sent to you. *The Forex confirmation is valid only till 5:00 PM, the same day (unless you have locked the exchange rate using the rate lock option). If you were unable to complete the transaction the same day, new rates will be applicable the next day. ***Door Delivery/pick up limited to transactions worth INR 49,999 or more and is subject to availability. Available only for customers living within 10Km radius of the chosen store. 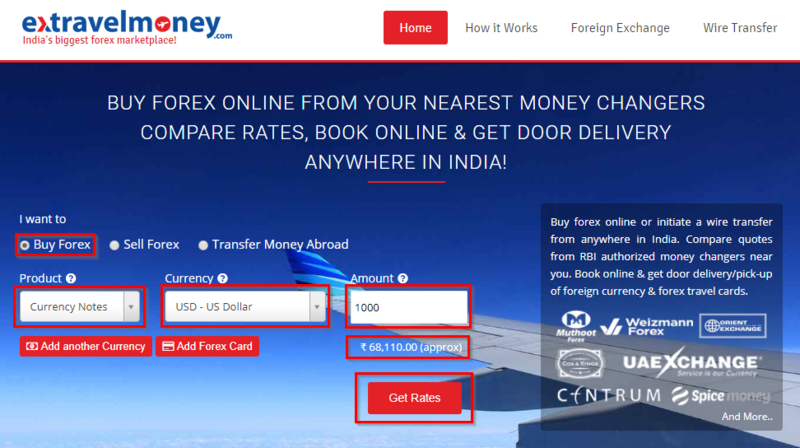 -- Foreign Exchange and Money Transfer services are available though Tied-up Reserve Bank of India approved Authorized Dealers/ Money Changers only. All foreign exchange transactions are subjected to AML/CFT/KYC & FEMA policies instructed by Reserve Bank of India. 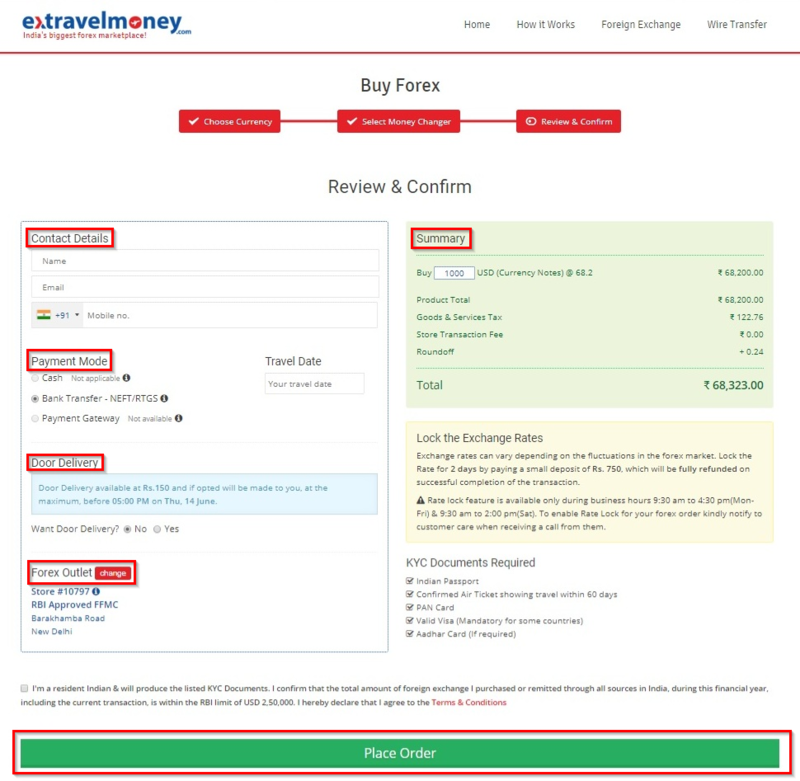 Extravelmoney.com does not hold any responsibility for discrepancies arising out of the transactions/communication with partnered service agents. Partnering service agent has the full discretion to reject the transaction, if the KYC/ Documents /Identity documents are not found in compliance with RBI/FEMA norms.